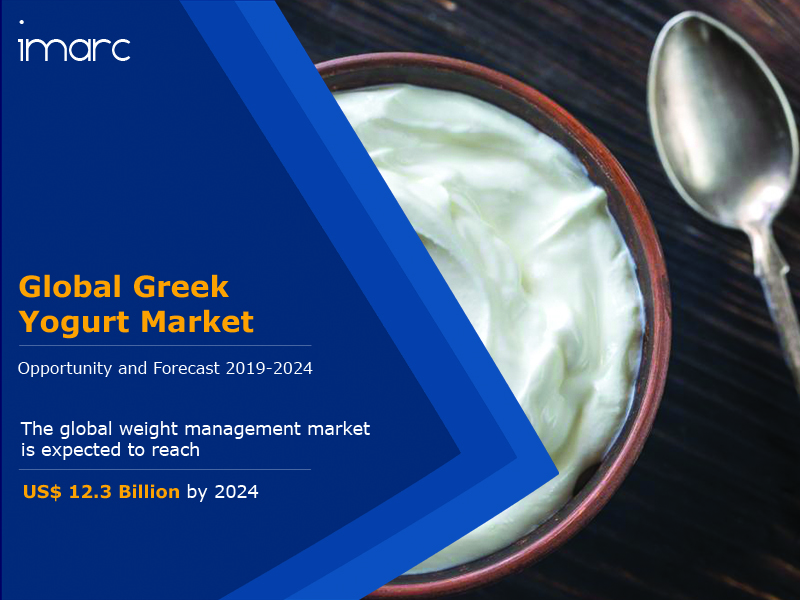 The global greek yogurt market was worth US$ 7.4 Billion in 2018. Greek yogurt, also known as yogurt cheese or sack yogurt is prepared through straining of curd and separating it from the excess watery whey. The straining process makes the yogurt thicker and creamier as compared to the regular curd. Greek yogurt has various nutritional benefits such as high protein, calcium, and vitamin-B content, probiotic properties, low carbohydrates, etc. They also come in a variety of flavours and toppings such as blueberry, vanilla, honey, chocolate, etc. It is also highly preferred by consumers for making various sauces and for marinating cheese and meat. One of the key factors driving the global greek yogurt market is the increase in health consciousness among consumers and change in dietary preference towards healthy and nutrient-rich food products. Owing to the increasing consumption of fat-free and weight management products, greek yogurt has gained immense popularity among consumers. In countries such as the US, Mexico, Canada, etc., greek yogurt is used extensively for meal preparation and is also consumed as a sweet snack mixed with fruits. It is also used as a substitute product for sour cream, smoothies, cream cheese and butter that has increased its application in the food and beverage industry. Additionally, the introduction of greek yogurt produced with natural and organic ingredients has also catalyzed the growth of the market. Consumers are increasingly preferring food sources that are gluten-free, chemical-free and produced with natural methods. Moreover, factors such as growing urbanization, a rise in the middle-class population, strong growth in online sales, etc. are also catalyzing the growth of the market. Looking forward, IMARC Group expects the market to reach a value of US$ 12.3 Billion by 2024, exhibiting a CAGR of around 9% during 2019-2024. The report has also analysed the competitive landscape of the market with some of the key players being Chobani LLC, Stonyfield Farm, Inc, Fage International S.A., General Mills, Inc., Dannon, Alpina Foods, Auburn Dairy, Delta Food (Vivartia), EasiYo, Ehrmann, Emmi Group, Glenisk, Kalypso Farms Dairy, Kri Kri, Mevgal, Muller UK & Ireland, Olympus, etc. How has the global greek yogurt market performed so far and how will it perform in the coming years? What are the key regional markets in the global greek yogurt industry? What is the breakup of the market based on the product type? What is the breakup of the market based on the flavour? What is the breakup of the market based on the distribution channel? What are the various stages in the value chain of the global greek yogurt industry? What are the key driving factors and challenges in the global greek yogurt industry? What is the structure of the global greek yogurt industry and who are the key players? What is the degree of competition in the global greek yogurt industry? What are the profit margins in the global greek yogurt industry?